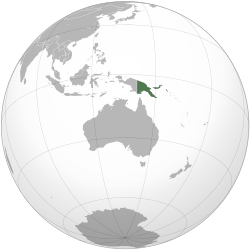 Papua New Guinea is an island country near Indonesia and Australia. It is the east half of New Guinea island, plus some nearby islands. The capital city of Papua New Guinea is Port Moresby. The population of Papua New Guinea are mostly the native population of the island. The island is in both Australasia and Oceania, which are two different terms for the continent of islands in the Pacific area. Papua New Guinea is divided into four regions. These regions are important for government, commercial, sporting and other activities. The nation has 20 province-level divisions: eighteen, the Autonomous Region of Bougainville and the National Capital District. Each province is divided into one or more districts. The districts are divided into one or more Local Level Government areas. Parliament has approved two additional provinces by 2012: Hela Province, which will be part of the current Southern Highlands Province, and Jiwaka Province, which will be formed by dividing Western Highlands Province. ↑ Somare, Michael (6 December 2004). "Stable Government, Investment Initiatives, and Economic Growth". Keynote address to the 8th Papua New Guinea Mining and Petroleum Conference. Retrieved 9 August 2007. ↑ "Never more to rise". The National (February 6, 2006). Retrieved 19 January 2005. ↑ "Papua New Guinea". The World Factbook. Langley, Virginia: Central Intelligence Agency. 2012. Retrieved 5 October 2012. ↑ 5.0 5.1 5.2 5.3 "Papua New Guinea". International Monetary Fund. Retrieved 20 April 2012. ↑ "''Post-Courier'', "Jiwaka, Hela set to go!" July 15, 2009". Postcourier.com.pg. 2009-07-15. Retrieved 2010-06-27. This page was last changed on 12 April 2018, at 00:59.